Folding tables function as portable banquet/dining options for events, celebrations, and business/education applications and as multi-purpose occasional tables appropriate for a variety of décor styles. They range in materials from wood to plastic to aluminum and are shaped to suit your needs. In this dining design, the tabletop is split down the middle width-wise, allowing the tabletop to fold in half once the legs are folded flat to the underside of the top. Hidden handles underneath the side of the table allows it to be carried like a suitcase once it is completely folded. Watch a fold-in-half-table tutorial to get an idea of how to fold and unfold a table like this. Weddings, birthdays, and special occasions - They are easy to set up and take down; can be dressed up with decorative tablecloths, place settings and centerpieces. Bi-folding tables also work well for small business or corporate event planning. The unique design of a serpentine style table works well for food displays, with the server standing on the shorter side with the inner curve. This design would also work well for a yard sale or flea market lot, allowing you to spread out display items. A slight disadvantage of this design is that the table can be hard to pull apart or open back up once it is folded and closed. You may need to muster up a little extra strength or ask for assistance when first opening the table. Lifetime's 8 foot Commercial Fold-in-Half Table is perfectly suited for use indoors and outdoors with a durable, UV-resistant polythylene tabletop and a rust resistant powder coated steel frame that compactly folds up. Backed by a 10 year warranty, a single table costs $160 or an order of 12 tables goes for $95 per table. The folding serpantine table at Webstraunt Store would be the ideal table for a catered event or garage sale display, opening up to a full length of 96 inches. It's very reasonably priced at just $113. Commercial flip top tables designed for corporate, educational and business applications are supported by sturdy, powder coated steel legs on rolling casters, making the table easy to move and position wherever it's needed. The laminate tabletop can be flipped sideways just by pulling a lever. The tables can then be stacked or nested together for storage. Commercial grade flip top tables are extremely durable and perfectly suited for use in schools, universities, and business offices. Their casters and nesting ability makes it easy to move multiple tables at once or to quickly set up a functional, professional looking workspace. Commercial flip top tables are heavy to lift and are not as easy to transport from location to location as bi-folding tables or tables with folding legs. 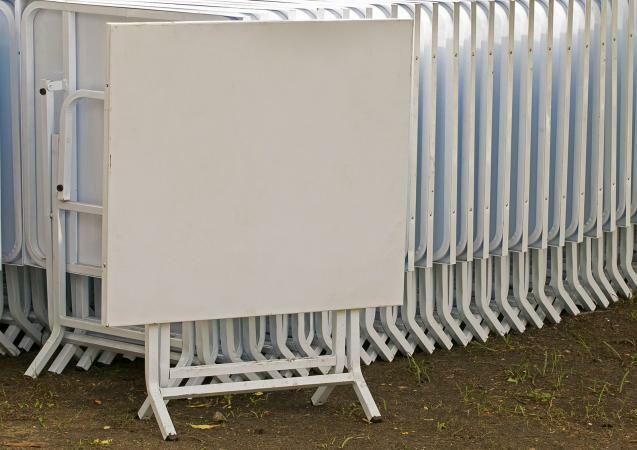 They can also cost significantly more than a bi-folding table, although not always. Commercial flip top tables are easy to find on websites selling industrial style furniture to restaurants and businesses. Most commercial flip top tables at National Business Furniture start at $400-$500 but Officient's 70 in. Plastic Valuemax Training Table starts at just $179. A built-in modesty panel with a trough and grommet holes keeps cables organized while the flip over top and rolling casters make the table portable and nestable for easy storage. Worthington Direct sells the Lumina Flip-Top Folding Table by Balt in a variety of sizes starting at $240 and ranging upwards of $350. Select between PVC and high pressure laminate (HPL) tops when shopping. Folding coffee tables come in many clever designs that can make them easy to move around or transition into tables of different sizes or shapes; some with removable pieces. X-frame coffee tables - The versatile design of the X-shaped folding legs allows the table to be positioned low or high; some come with removable, handled tray tops or a base that flips sideways, converting a tall butler table into a low coffee table. Portable folding coffee tables - Collapsible folding legs make these tables easier to transport from room to room; some fold in half with built-in handles while others can go outside for short-term use with protective finishes designed to withstand UV rays. Be careful with young children, toddlers and pets around these mechanical tables, especially when closing them. Small children, dogs or cats may try to climb inside or have their fingers, paws or tails in harm's way. Folding coffee tables come in many styles, making it easy to find one that will complement practically any decorating style. The versatile brushed chrome X-frame of the Senter Transforming Coffee Table at Wayfair allows you to lock the table at any height; paired with an unfolding laminate wood top in three finishes, it actually transforms into a dining table. Priced just under $300 with free shipping, it's a real bargain. Create a carry case with a handle when you fold up the Spiderlegs Folding Coffee Table (about $160). It has several hinges and is easily transported in the neat size when folded. L-shaped legs - This is one of the most basic and easy to use designs suggested for seniors and the disabled; folds flat enough to slide under the couch or could be stacked along the side; see how to adjust the table's height and fold it by watching a video. X-frame tables - Lightweight, with tops that fold flat against the side or split open first then fold flat, these tables are easy to carry from room to room or to any outdoor dining spot. Lap trays - Similar to a side table on a smaller scale, these personal little tables support themselves on small folding legs just right for straddling one's lap in bed or while seated on a sofa. 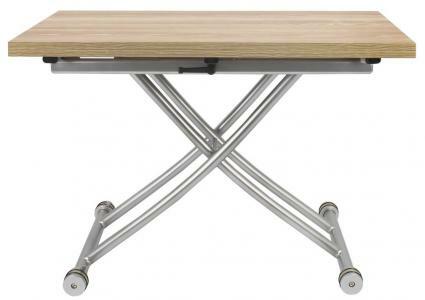 Sometimes folding tables have small pins or release levers that allow the legs to fold. Flip the table over if you're having trouble folding it and if all else fails, read the instruction manual. Place two folding side tables or a table and a laptop tray together to make a mini bar. Include a bucket of ice with tongs, some plastic cups, a few premium liquor bottles and one or two mixers like ginger ale and club soda. Cover the top of a wooden folding side table with cotton batting and fabric (cut to size and stapled underneath) and use it as a mini ironing board. Turn the side table into a game table by painting a checkerboard on top. Add a decorative box or basket roughly the same size as the tabletop and use it in the bathroom to hold a collection of pretty hand soaps, bath beads, lotions or perfumes. Use the table as a portable message board wherever it's needed around the home. Mask off a rectangle and fill it in with chalkboard paint. Glue small stones, beads or shells around the edges for a decorative border. Keep the chalk and erasing cloth in a cute cup or candy dish. 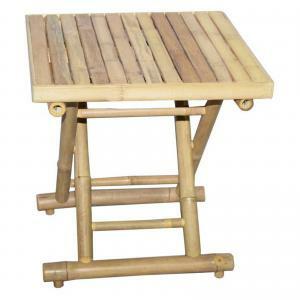 Folding side tables aren't very sturdy and can easily be tipped or knocked over. Be extremely careful with hot liquids, fragile objects, and electronics when using these tables. Start by checking out some of your local thrift stores for folding side tables or old TV trays. Make sure the joints and legs of the table are sturdy before you buy. A little metallic or brightly colored spray paint can make an ugly little table look like a shiny new jewel. Small, lightweight and ready to go wherever you take it, Bamboo 54's Bamboo 18 in Square Side Table provides a convenient surface for a drink or a book with a touch of tropical flair. Lots of people on Amazon are giving the Costco Adjustable Height Folding Side Table a five star rating; noting that its sturdy, durable and lightweight, perfect for tailgate parties; customers love the five color options, the easy use and the 2-for-1 price just over $40. Wall-mount drop leaf table - Designs vary slightly from brand to brand; some have a small ledge in the back that serves as a narrow shelf for small collectibles when the table is folded down; can be supported by one or two brackets that fold or release via push-in pins or levers. Fold-down Murphy bar, Murphy desk, or convertible folding desk -- this ingenious design looks like an ordinary wooden cabinet until you open and unfold the multi-paneled door, forming the side and top of a small desk or a minibar. Hidden storage shelves are revealed within the wall-mounted frame. 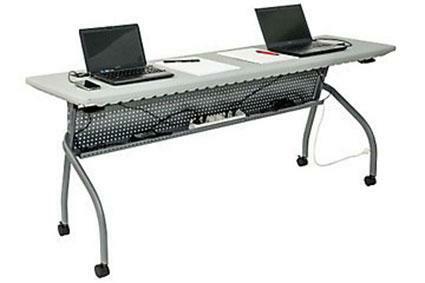 Fold-away table or desk - Instead of dropping down, the table is folded up, attaching to a briefcase sized frame that has storage cubbies and shelves; its compact size makes it perfect for laptop or notebook computers. Picture or mirror frame folding table - Four table legs unfold from the frame of a large picture or mirror, which detaches from the wall first at the top and then from the bottom, converting into a table that seats up to six; wall-attached tables with two unfolding legs also available. A wall-mounted folding table placed in a laundry room provides a convenient surface for drying delicates or sweaters that need to lie flat or for using a tabletop ironing board. Install a wall-mounted table in the basement, a game room or playroom for card and board games when needed while allowing plenty of open floor space for other, more physical games. Add some spirited fun to parties on the patio with a fold-down Murphy bar. Picture frame folding tables can be customized with your own photo - it would make a unique and memorable anniversary gift. Most wall-mounted folding tables remain attached to the wall so you can't seat people all the way around the table. Also, pay attention to how much weight the table is rated to hold, especially if it doesn't have legs; it will be significantly less than a standard table of similar size. Resource Furniture is the U.S. distributor for high-end, Italian made folding wall-mounted tables such as "Wally," a brightly lacquered fold down dining table available in dozens of different colors and other customized configurations such as the inner shelving; all tables are made to order with a 12 to 16 week lead time required. Simple and affordable, this IKEA wall mount drop leaf table comes in black (35 in. length) or white (29 in. length) , starting at $30-$39. The Premium Model Picture Table by Ivy Designs has four legs that cleverly unfold from the frame, which also lifts all the way off the wall, transforming into a table that seats six. The frame color and picture can both be customized. The table is made in Austria but can be shipped worldwide. Price in euros equals $3370 plus about $230 shipping. 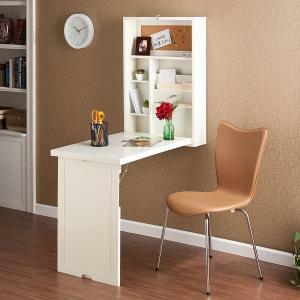 Southern Enterprises Fold-Out Convertible Desk in antique white folds away into a simple cabinet when not in use but quickly transforms into a handy work station when needed. It's about $170. No matter what type of home or lifestyle you have, there's probably some type of folding table out there that you could benefit from. These tables are getting better all the time; you just need to find the right one.